Amazon Web Services (AWS) offers highly scalable, elastic, and secure cloud services that help customers more easily ingest, store, process, deliver, and manage content in the cloud. Moving your digital asset management to the cloud enables you to take advantage of the latest innovations in asset management and supply chain applications. However, it can be a challenging and slow process to migrate your existing video archives to the cloud. To help streamline and automate the migration process, AWS offers the Media2Cloud solution. This solution sets up a serverless end-to-end ingest workflow to move your video assets and associated metadata to the cloud. The solution leverages the Media Analysis Solution to analyze and extract valuable metadata from your video archives using Amazon Rekognition, Amazon Transcribe, and Amazon Comprehend. Media2Cloud also includes a simple web interface that enables you to immediately start ingesting your archives and extracting metadata. 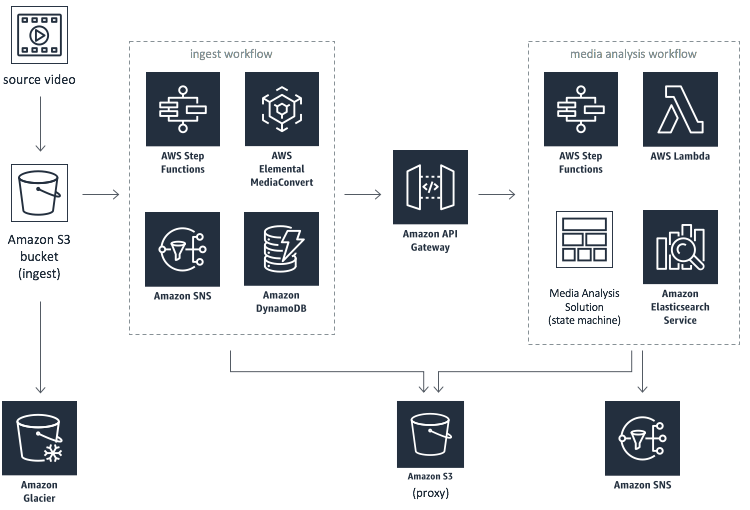 This solution enables customers to quickly and seamlessly extract key details from their media files in their AWS accounts without machine learning expertise. The solution also includes a web-based user interface that customers can use to upload and search their image, audio, and video files. The AWS CloudFormation template deploys two workflows: one that ingests source videos and one that analyzes and extracts metadata from your videos. The ingest workflow includes AWS StepFunctions and AWS Lambda, which orchestrate the ingest workflow and trigger AWS Elemental MediaConvert to create standardized proxy files and thumbnails of the uploaded videos for analysis. Proxy files are stored in a proxy Amazon S3 bucket, and media information is stored in Amazon DynamoDB. When video processing is completed, Amazon Simple Notification Service (Amazon SNS) sends notifications to subscribed users. An Amazon API Gateway RESTful API starts the media analysis workflow. Step Functions and Lambda functions leverage the Media Analysis Solution to analyze and extract machine learning metadata from the proxy files. A Lambda function transforms the metadata results into WebVTT subtitle tracks, chapter markers, top 5/10 key phrases, and labels information. Then, the metadata results are stored in the Amazon S3 bucket and indexed in an Amazon Elasticsearch Service (Amazon ES) cluster. The ingest bucket has an Amazon S3 lifecycle policy that allows the solution to move uploaded videos to Amazon S3 Glacier for video archiving. The solution also deploys a simple web interface that makes it easy to upload, browse, and search video files and extracted metadata. The web interface leverages Amazon Cognito for user authentication and is powered by web assets hosted in an Amazon S3 bucket. Amazon CloudFront is used to restrict access to the solution’s website bucket contents. Leverage the Media2Cloud solution out of-the-box, or as a reference implementation for building a serverless framework to accelerate the setup and configuration of a content ingest process. The solution also creates a a simple web interface that makes it easy to upload, browse, and search video files and extracted metadata.